Angelic #1 Review – AiPT! Fantasy readers are going to love this. What’s a young girlmonk to do when her future is planned but her mind wants something more? Image is bringing a new world to life in Angelic with the talented imagination of Simon Spurrier and the artistic exploration of Caspar Wijngaard. With the whispers of mankind around each corner, the species that remain must pray, fight and survive. 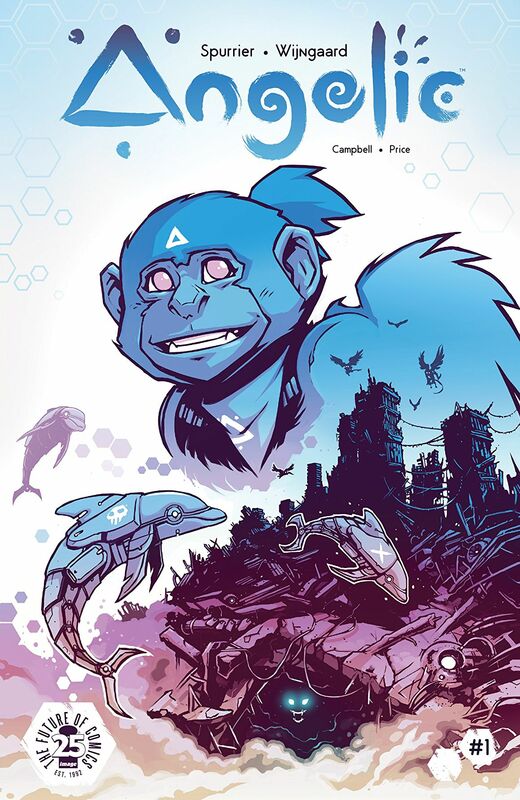 Fighting her way through cyber-dolphins, gibbons with energy blasters, and flying monkeys, our heroine Qora — herself a flying monkey — tries to find her place while ultimately being bullied into a life she does not want. It’s weird, it’s exciting, it’s a bit disturbing and kind of sad. But, is it good? When I started reading Angelic, I was expecting fantasy and lots of interesting creatures; I was not expecting the story that went along with the world being portrayed. You start off being introduced to a world that is no longer a “human” world. The main groups we see look to be a variety of primates — flying monkeys and gibbons at the moment — and a few robotic dolphins and some birds — maybe large crows. Everything seems to have been a genetic experiment but with humans gone they’ve started multiplying on their own. We’re following Qora around throughout the book. She’s a very strong willed character, and doesn’t believe in the ideas of the flying monkey society, a very cultish group. She is told at a point that she has a purpose. One purpose, that’s it, and to follow that purpose means she loses something extremely important to her. This is also a section where I re-read and realized it’s a little more adult than I was expecting. Everything is insinuated but you definitely get the idea. The writing is amazing. Spurrier has given each species their own dialect and the text portrays a great image of what it may “sound” like. I loved this because it really gives an idea of how the factions have been taught to communicate. The design of each species and character is very delicate. Wijngaard took time building the world and characters in it and it shows. The scenery pulls little remnants of the past world so you can see the destruction that must have happened before the change. Each creature seems to have their own personality and expression — there’s little left out as you look through the issue. I think the dolphins have to be my favorite. They’re just adorable robotic jerks. I wouldn’t say there’s anything bad about the issue, but it is a bit busy. There’s a ton to look at and to understand just within the first issue. You have to meet at least four different species and try to grasp what they are and why they do what they do. With the mature content in parts of the story, Angelic would probably work best for teenagers or older. As an adult I would totally read this but it is on the easier side. Check it out — there’s nothing to lose and the idea here is pretty interesting. Fantasy readers are going to love it and if you’re into reading about animals this is the series for you. Fantasy readers are going to love it and if you’re into reading about animals this is the series for you. Strong female lead -- with wings!